Music collaboration service Indaba has just introduced a number of new features to its site, including a new Facebook-like chat system, enhanced commenting, and a recommendation engine that helps compatible artists find each other, effectively enabling it to automatically pick out potential bandmates. The site has passed under our radar since launching in 2007, but has grown to over 125,000 thousand musicians. Indaba is a music community for musicians looking to remotely collaborate with each other, and to share the music they’ve composed. However, while the site does make it easy to listen to what other members have created (songs can be played using an intuitive player than sits at the bottom of the screen), Indaba isn’t geared towards promoting your band and gaining fans (at least not yet). To actually create music, users typically record their tracks using programs like GarageBand, and then upload their tracks to an online session. 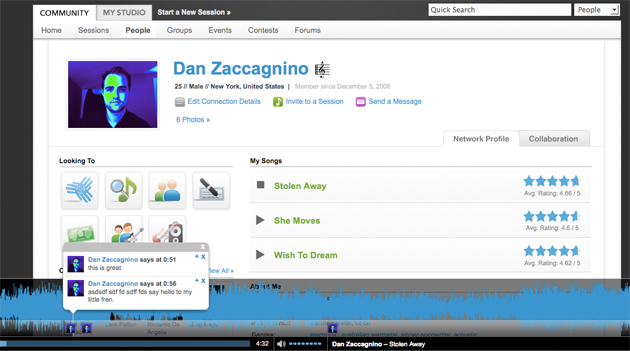 In these sessions, multiple users can use an integrated chat box to talk about tracks, and can also use a Flash-based mixer to rearrange pieces from each musician. At this point the exporting functionality of the service could use some work (you can only export as regular audio tracks, not as GarageBand or ProTools, though this is because of proprietary file format issues). The site also allows users to set up payment agreements, which means you can essentially work as a studio musician from the comfort of your own home. Users can also use the site to specify the rights associated with each song. Among the new features being launched today are in-song comments, while allow users to leave a comment with a visual indicator specifying where in the track they are referring to (for example, I could leave a note saying that I liked a certain guitar solo or drum beat). Musicians can also leave notes for their audiences that will appear when the track has reached the relevant point (I could leave a note saying, “I’m still working on this part”). Another new feature is an enhanced site-wide chat that is similar to Facebook Chat. Using the new system, users can monitor when their friends are online, and can talk regardless of where they’re browsing on Indaba. Finally, the site is using technology from EchoNest (an audio company out of MIT Media Labs) to generate musician recommendations. Unlike most music recommendation engines, which pair users up with songs they might like, the EchoNest system is meant to pair musicians who might work well together. The system takes both the songs you’ve previously recorded on Indaba as well as interests you’ve specified in your user profile into account. Indaba competitors include Minimum Noise (covered here), WeMix, and Indomite.